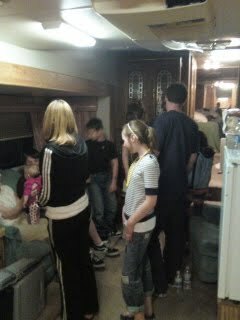 At one point this week I had my family in my RV. You can only see 9 of them in the picture but there were 6 more out of range. It was pretty funny. Not very comfortable as there was nowhere for everyone to sit but funny nonetheless. I am so glad it is Friday. It was a very long week. Work has been especially tedious. I think it is because my family is here and I would rather be spending time with them but I have to spent all day at work and then I am too tired in the evening. At least tomorrow is Saturday. I have to take my black dog to the park to meet a prospective adopter. Right now I am enjoying a few moments of free time and watching old Simon And Simon shows that I got from Netflix. I get to watch them until my parents get home and change their address back to their home. It's fun to watch them but I wouldn't sign up for Netflixs just yet. I definitely don't have time to watch enough shows to make it worth the money. I bet that is approaching a world record for people in an RV.